Staxton secured the Readers Scarborough Beckett League Premier Division title on the final day of the season with a home win against Forge Valley. The home side were forced to work hard for their win, which, left them four points ahead of rivals Staithes, who collected a seven-wicket home success against third-placed Filey, but this was not enough to earn a third successive title win for the Whitby side. Valley batted first and were all out for 204, with Joe Bradshaw smashing a superb 90, with valuable support from teenager James Fox (33) and Charles Tindall (25), but the keen bowling of Dan Outhart, who took a hat-trick in his 5-41, and Ryan Hargreaves (3-28) kept Staxton in the game. Jonny Aldcroft's impressive 63 and a useful 50 from Chris Dove put Staxton on the right track, an unbeaten 33 from David Morris making sure of the win which secured the title, Nasar Khan claiming 3-44 for the visitors. Staithes dismissed visitors Filey for 150 in their game, Tom Steyert snapping up a superb 8-60 for the home side. Aussie ace Tom Fitzgerald struck 50 and Nathan Robson 35 not out for the Clarence Drive club. Dave Morris and James Armstrong walk off the pitch all smiles after sealing the title for Staxton. Richard Hegarty smacked 36, then Steyert capped a cracking all-round day with 42 not out as he and Simon Bowes (35no) wrapped up the win, Josh Dawson taking 2-39. Settrington avoided finishing bottom thanks to a four-wicket win at Cayton. Stephen Beal bagged 3-16 as the hosts were dismissed for 177, Tom Sixsmith hitting 35 and James Ward 31. Ward and Sixsmith took two wickets apiece as Settrington struggled early on but an unbeaten stand for the seventh wicket between Eddie Rounthwaite (83no) and Jonty Rounthwaite (50no) secured the win for Settrington, who climbed above fellow relegated side Cloughton after they conceded their final game of the season at Heslerton. 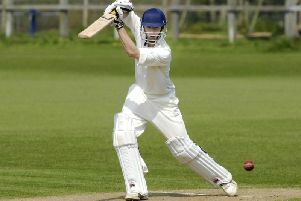 Ebberston signed off their season with a three-wicket home win against Seamer in a low-scoring affair. Ed Swiers and Frankie Beal capped fine seasons with the ball, taking 3-15 and 3-24 respectively, the leading Seamer scorers being Craig Baker (35) and Anthony Jenkinson (27) as they were dismissed for 101. Matty Turnbull's 42 saw Ebberston edge their way to victory with seven wickets down, Matty Morris' 3-13 making the hosts dig deep for their win. Jonny Pickard finished his season in style, the Nawton Grange batsman hammering an undefeated 131 as his side won by two wickets in a runfeast at home to Scalby. Solid efforts from Paul Hesp (39no), Matthew Tissington (38no) and Chris Malthouse (32) guided Scalby to 228-7, Ben Stamp, Ben Mountain and John Cranage bagging two wickets apiece. James Deaves (3-52) and Brad Walker (2-16) gave Grange a few nervy moments, but Pickard's stunning knock, aided by 47 from Charlie Allott, saw them claim victory.